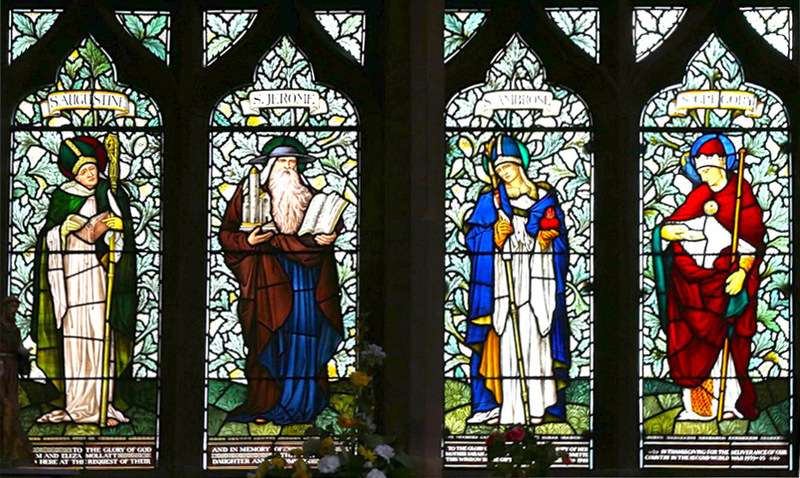 St Augustine, St Jerome, St Ambrose and St Gregory, for All Saints, Leek, by Morris & Co.
St Augustine, St Jerome, St Ambrose and St Gregory, by Morris & Co.. This window is halfway down the south aisle of Richard Norman Shaw's All Saints, Leek, and takes us much beyond the Victorian period, since the listing texts states, "S aisle window, Morris and Co, 1947-8." Yet, as elsewhere, the figures look like designs from Edward Burne-Jones, whose stained-glass cartoons continued to be used by the Morris company, perhaps in modified and adapted ways, long after his death. "Parish Church of All Saints, Leek." British Listed Buildings. Web. 15 November 2015. Pevsner, Nikolaus. The Buildings of England: Staffordshire. New Haven and London: Yale University Press, 2002.